At Sun & Sky landscaping, we have property maintenance packages customized to fit your budget from a basic lawn cut to full weekly lawn and garden services. We offer weekly and bi-weekly services that are handled by uniformed, experienced, and dedicated professionals. When maintaining your property there are three things we focus on in order to ensure that your property looks its best week in and week out. These are cutting and trimming your lawn, Weeding, cultivating, and edging all flower beds and tree rings, and Pruning of all hedges and shrubs. 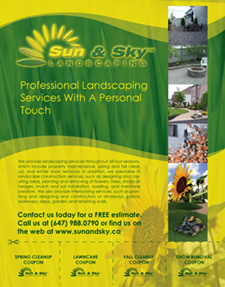 Contact Sun & Sky today and look forward to enjoying your property instead of working on it.